This compendium dates from relatively late in the career of Christoph Schissler. His son was already signing instruments of his own in the 1580s so the father distinguishes himself here as 'CHRISTOPHORVS SCHISSLER SENIOR'. The format of the instrument is very similar to designs that Schissler had devised as early as the 1550s. 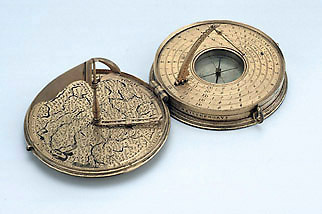 This example carries a Profatius astrolabe-quadrant, a map of Central Europe with wind vane and compass rose, a horizontal string gnomon sundial, adjustable for latitude, a table of the latitudes of places, an orthographic planisphere, and a lunar volvelle.